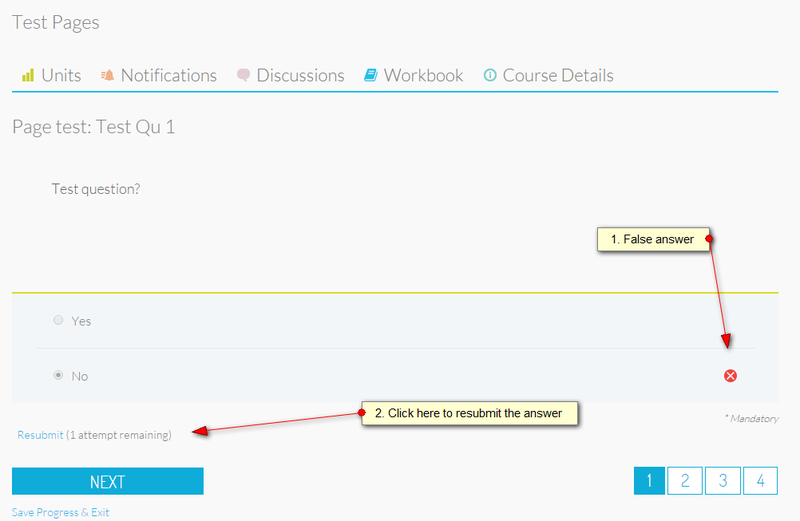 I have set up a course that should allow users to answer questions 3 times - however there is no method to allow this or to allow the whole course to be retaken. In my opinion it would be better anyway if the user could be allowed a set number of attempts to redo the course - rather than this setting that relates to each individual element. On my demo I would like to allow a student to take the course up to a set number of times. Or allow the instructor to reset the course for the student to retake. I've just been testing this on my own install and can replicate the same issue, the limit attempts setting isn't working. The lead developer has been notified so we can get this fixed ASAP. By this i mean retake the whole course. This way if a course had an overall pass requirement of say 80% and the student got less than 80% they would be able to retake the whole test. If it is managed at an individual element level they would just go through and answer the ones they got wrong until the % was high enough. Maybe there is an option for a student to retake an entire course already - but even when i tried to withdraw from a course and then join it again - my old test scores were stored. Can you let me know if there is a method to retake an entire course? I saw this feature this time. I completely missed it the first time around. 1. When you try to resubmit answers on a unit that uses pages it will always default back to the first page of the unit. You can recreate it here http://coursepress.simplecsr.com/courses/test-pages/units/page-test/ on the first unit. Try to te take on of the questions from the second, third or forth page. 2. Is there any way to allow a user to retake the entire test from new? So if they failed, can they retake the whole test not just the questions they got wrong. 2) No, there is no way currently but I'll put this one as a feature request. However, it would require more time to implement so I can't say exact date when we may implement it. It would be great if other members vote for this feature - that would prioritize this feature and speed up development process.